"Not all apocalypses are cataclysmic"
The year is 2061. The Golden Age of empowered heroes ended in the cataclysmic fires of The Collapse. Costumed demigods brought the world to a dire precipice and individuals and institutions are still picking up the pieces, still walking the precarious tightrope of a world-shaking paradigm shift. The world is not as it once was. The relics of the Golden Age, natural and artificial both, stand as monuments to a period of history that some wish to forget. All across the known world, individuals and institutions traverse the ruins of history to guide the new world towards salvation, preservation or destruction. In a city on the verge of collapse, Sabra Kasembe dreams of being a renowned hero, even as her idealistic efforts draw her towards a future where the only crowds calling her name are her victims. Pavel Fisher is a weary ex-hero, bereft of powers and costume in the wake of horrific trauma, listlessly searching for purpose. When their lives intertwine with that of the iconoclastic mercenary known only as Leopard, whose murderous associates threaten to usher in an apocalypse, the trio realizes that maybe — just maybe — three people can change the course of history. But heroism and villainy are matters of perspective — and narrative. Not all apocalypses are cataclysmic. And some say apocalypses never merely end. 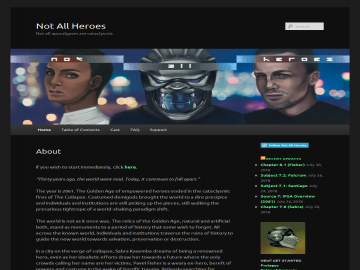 Not All Heroes has not been reviewed yet. Not All Heroes has not been recommended yet.